As Comic-Con regulars know, there’s nothing more valuable at the yearly convention than time. With panel lines literally out the door and the Exhibitor Hall packed wall-to-wall with scurrying people, it’s often hard to decide how to allocate your precious time. This year, we’re making that decision a no-brainer. Want to know why? You guessed it (probably because it’s in the headline of this post!) 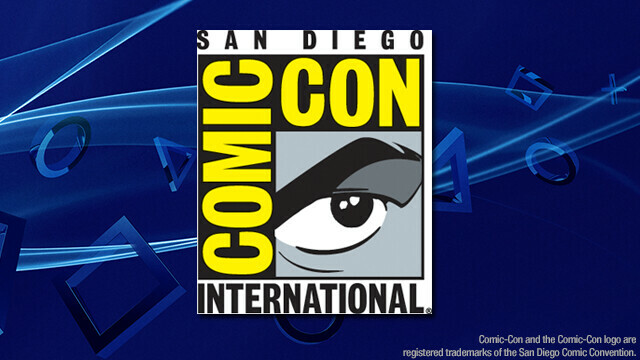 – we’re bringing PS4 to Comic-Con 2013. For the first time ever, gamers can go hands-on with the PS4. On top of that, we’ll be showing off some of this year’s most highly anticipated PS3 and PS Vita titles, as well as participating in a number of panels throughout the weekend. If that’s not enough, we’re also hosting contests at the PlayStation booth every day where we’ll be giving away PS Vitas! Description: Neil Druckmann signing with Faith Erin Hicks for The Last of Us American Dreams in the Dark Horse Booth. Note: this is a ticketed event. Description: Quite a bit has changed since Dark Horse first published Mass Effect in 2010, as the publisher has grown this line of books to include franchises like Last of Us, Dragon Age, Bioshock, The Legend of Zelda, and most recently, HALO and Tomb Raider! From canonical comics to beautiful hardcover art books, Dark Horse has firmly established that there is life for popular gaming franchises far beyond the games themselves. Dark Horse PR director Jeremy Atkins, creators Faith Erin Hicks and Neil Druckmann (The Last of Us), and some surprise guest writers and artists offer a look at what’s to come. Description: Join Robert Kirkman (Creator of The Walking Dead comic series) and Telltale Game’s Dan Connors (Telltale Games, CEO) and Kevin Bruner (Telltale Games, President and CTO) as they discuss the inspiration behind developing the critically-acclaimed game series. Along with PlayStation’s Don Mesa (Director of Product Planning & Platform Software Innovation, SCEA), the team will walk fans through the origins of the game, reveal details on exciting new gameplay features exclusive to PlayStation Vita and include a little sneak peek on what’s to come for next chapter of The Walking Dead game series. Q&A moderated by Greg Miller (Executive Editor, IGN). For more details check out our dedicated Comic-Con 2013 page, and if you will be attending the event be sure to RSVP on Facebook. Finally, to stay up to date with PlayStation at Comic-Con, be sure to follow @HeyPlayStation on Twitter. We look forward to seeing you there! Looks cool. I can’t wait to check out the PS4 at PaxPrime in August. Hopefully you guys will bring even more Ps4 Love to that event. (Personally I would love to play Infamous: Second Son). Octodad is a great choice. Wish I could go. That’s cool that Octodad is one of the PS4 games being shown, is that a clue that it might be available at launch? I read that as Neil Druckmann singing :). Anyway, will there be new news on games? It would be really awesome if Uncharted 4 was announced as a launch title. Hopefully I can get to San Diego In a week for my first comic con and second son would have been sweet .November is the month to not be dead by lol. Ps4!!!! will the ps4 be coming to the comic-con in salt lake city utah? Will any of these things be at Chicago Comic-Con? That’d be pretty snazzy. It seems like am going to miss out, well have fun for me too guys. @6 T3DV0L70L1N4 I second that! I’ve been waiting to hear an announcement about Un4!!! I pretty sure mentioning the competition’s main franchise “HALO” on a Playstation website is one of the 7 Gaming Sins. Will be in attendance at Comic Con and really hoping I can get Hands on Wednesday (Preview Night) otherwise will have to do so between Thursday and Sunday, also really excited to get hands on with Dragons Crown at The Con….. I just want news and info about Walking Dead game season 2! Will Sony be at Comikaze in Los Angeles in November? I will be there and I will be living at your booth!!! Bwa-ha-ha-ha-ha-haaaaaa!!! WHY ITS THAT VIVI AVATAR NOT ON THE PSN!!!!!???? I NEED IT!!!! Sounds like a fun lineup. I’d like the behind the scenes on the Walking Dead. As I will not be travelling to San Diego sadly, but will be at New York Comic Con in October, will there be a PS4 hands on at NYCC? So excited for this :) My first SDCC and I am going to raid the Sony booth! :) Will you guys have some swag? Lucky are those who can attend.VERY LUCKY. Hopefully I’ll at least be able to get the exclusive SDCC My Little Pony toy since I won’t be able to attend. I love to go but i live to far from it. :( Oh Well. You mean you’ll have the actual *final* PS4 at Comic-con, as in with many of the launch features and allow players to check all of that too, like online multiplayer menus, shared videos functioning hands on, etc? Will we be able to test the PS Store running on PS4 or downloading a game (demo, maybe) while playing it? just how much functional will this PS4 be and be allowed to test by the visitors? I want P O R S C H E into Gran Turismo 6!!! I think Sony should have a better GPU than 1.8Tflops. When we compare it to like say, a current gen Mac Pro, for example. It only has 2.7Tflops. But the new Mac Pro is going to have 7Tflops. That way more raw power than it’s predecessor. Now granted, I don’t expect the PS4 to have 7Tflops, but if the PS4 can have 2.6Tflops at least, then it will be a console that’ll last much longer during this gen.
Not only that, but Microsoft can change it’s stats of it’s Xbox One at any time. Either way, it will be a welcome surprised to have a higher GPU performance. That uncertainty of PCs becoming more powerful, you have to input more power in the GPU. You do that, you essentially win next-gen. Right now, you are winning, but who knows what can happen from here until the launch. -Processor CPU: The number of cores and how many Gbs of PCI bandwidth speed it has. Of course, the processor itself is nothing without a good GPU. 8 cores is enough for now. 12 cores would be a waste since most PCs only have 8 cores and Xbox One is only getting 8 as well. -Graphics GPU, If it’s singular of dual, and how many Tflops it can have. This is most likely the main piece for better graphics. -Disc, of course, the Blu-Ray is the best on the market, but it can produce far greater games because of it’s capacity, just look at some of the PS1 games VS N64. Games like Legend of Dragoon and Final Fantasy 8 were way better thanks to picture based backgrounds and the storage of the disc for awesome CG cut-scenes. Everyone is getting the same, so no advantage to anyone. -Memory Ram; I would assume it would come here, but given the fact that it’s 8Gb of GDDR5 and gives 170Gb/sec VS 68Gb/sec of a 8Gb DDR3, that’s pretty significant. It’s like having 20Gb of DDR3, in fact, it is equal. No need for an upgrade here on the memory side.